An engineering team from Wits University and the South African Nuclear Energy Corporation (Necsa), have developed novel technology to turn biomass (agricultural waste) and garbage (solid municipal waste) into liquid fuel, electricity, waxes and paraffin. It is the first time that this innovative project, developed in South Africa by South Africans, has been manufactured on a small-scale to make it economical for South Africa and other developing countries. The BeauTi-FueLTM Project, an environmentally-friendly plant small enough to fit into a standard 40 ft container on the back of a truck, was launched today, Monday, 21 November 2011 and will be driven down to Durban on the 25th of November to be showcased at COP17. A full-scale plant will treat 91,000 ton per annum of municipal waste, which will produce enough power for 10,000 homes, enough heat for around 700 homes, increase recycling rates by over 20% and will create about 200 jobs, mainly for unskilled workers. The Project has a negative carbon footprint and the lowest environmental impact. “In the long run we would hope to use the very clean carbon dioxide produced by the process to grow algae that could be harvested and fed back to the plant or used to feed fish. This will be labour intensive and could create even more work for unskilled people, as well as possibly providing protein from the fish for consumption purposes,” adds Hildebrandt. “The superior conversion efficiency of the plasma gasifier and the ease with which the process gas could be manipulated to optimise the fuel production, combined with the resultant fuel gas generating electricity, renders this a sought after system for anyone who generates waste,” says Dr Jaco van der Walt, the Plasma Scientist from Necsa. 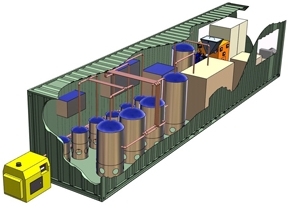 The R5-million pilot plant will be demonstrated at COP17 and a functional prototype will be built by mid-2012, which will be showcased at different public events and locations around the country. During this period, the technology will be refined and the facility will be demonstrated to potential clients.